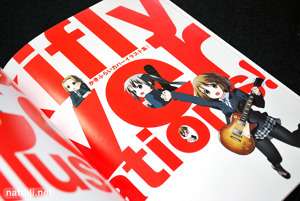 I was quite surprised by the contents in the new K-ON! Super Illustrations Vol. 1, as it features a combination of official art by the manga creator Kakifly (かきふらい) and tribute illustrations by a wide range of well-known (and relatively unknown) artists. It's an interesting mix, and it just makes me think they didn't have enough of either to put out a full art book. But seeing as how it's labeled as volume one, we can be expecting more of these in the future. 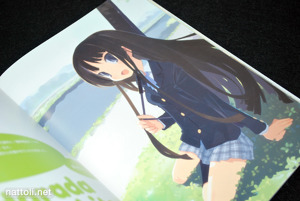 The book starts out with a newly illustrated 4-panel poster with Yui on one side in a bikini and Mio on the other, also wearing a bikini. If you're familiar with Kakifly's illustrations, you'll know they're not a lot like the Yukiko Horiguchi designs you see in the anime, but they have their own charm. 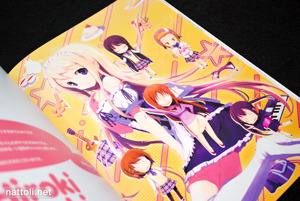 Kakifly's art work takes up the first 33 pages of this 120-page art book. On the down side it's really more like every other page, as the page layouts are one page illustration, one page line art for the most part. 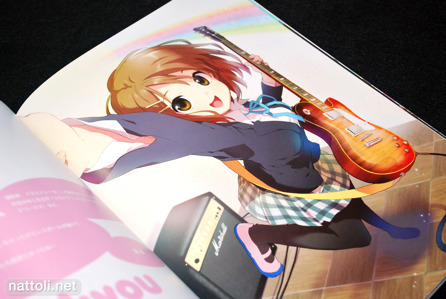 The illustrations are mostly cover arts for the manga volumes, and covers that appeared on Manga Time Kirara Magazine where K-ON! 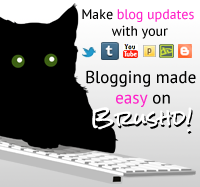 is published. The rest of the art work in this collection is all essentially fan art. Much like with the Code Geass Heroine's Tribute that came out last year, each artist gets an information page with a sketch next to their finished K-ON! character illustration. 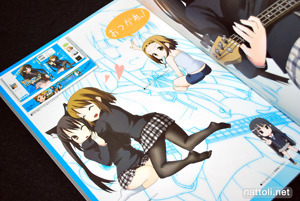 Of course, Mugi and Ritsu do get some love too. It's really amusing to see how different artists take on Mugi's very distinctive eyebrows. Above top row we have Nilitsu, Shin Hashimoto (who was in the most recent issue of Gelatin), and Yohichi Ariko. In the bottom row from left to right we have Kyo, Mirura Yano, and Siro. In total, there are 40 different artists in the latter half of the book, each with one illustration. 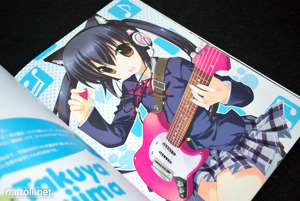 Some are a little on the weird side, like the picture of Yui above by kiR-Rin. 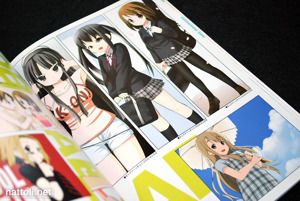 But most stay true to the character designs and personalities of the K-ON! girls. 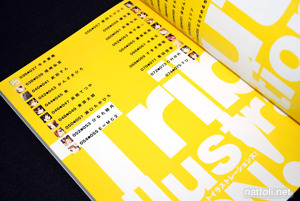 There is an index in the book, but it only includes the official art works by Kakifly, as the rest were clearly labeled on their information pages. 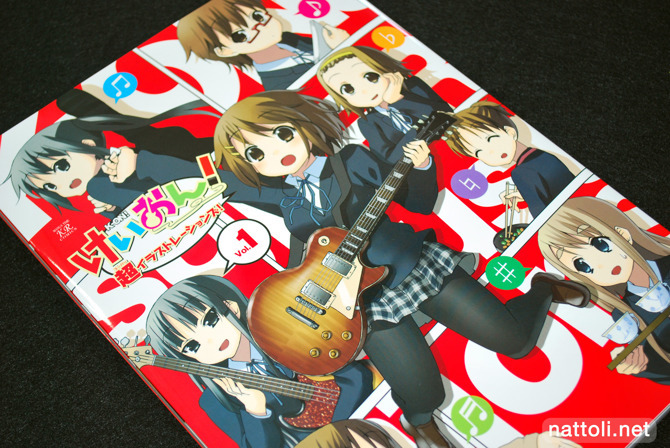 Is this the first K-On book? It's the first with art from the manga, and the first that focuses on illustrations. There has been an anime guide released, which has the illustrations you may have seen from the anime that appeared in magazines and the like. 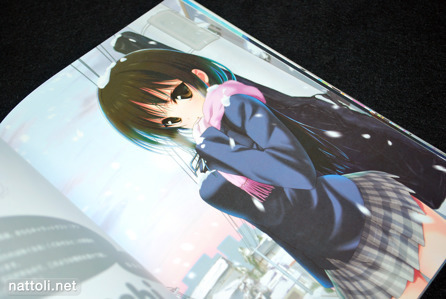 Have you heard of Tony Taka's new art book which is out this month? It's supposed to be a collective of all works [Ciel] or something. Not really sure since I don't keep tabs on eroge or anything but it looks pretty good. I ordered it off Kinokuniya USA already and should get it soon, weather permitting. That's actually good to hear because I too have Collect1 and it's sitting wrapped up because of the intense eroticism emanating from underneath the cover (^^;) Not something you can just lay around the house even if you're by yourself. I think you just convinced me to get this book. Kakifly's art is pretty good, but I'm especially interested in seeing what the other artists have to offer, and I'm sure it'll look even better in print. 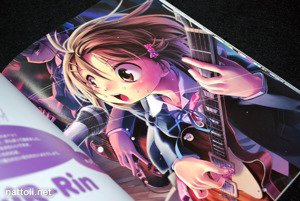 Thanks for the review of this 'K-ON!' book, wasn't sure about the art in it and am not really a fan of Kakifly's style. Not that I dislike Kakifly's art either... think it's due to the coloring style he uses which isn't my favorite. No tengo idea de que ponen ya que esta en ingles... Pero bueno,lei algo,se ve bueno!!! !